Carry a self-defense handgun at all times when you select the UnderTech UnderCover Executive concealed carry V-neck shirt. This selection is popular with travelers, executives, and business owners, as well as people who like to work out. It features a great concealed weapons holster under the left arm and a small pocket that is perfect for carrying cash, credit cards, relevant documents, and mobile devices. Our business is known for offering the best clothes for concealed carry. We are confident that you will be pleased with this quality selection. Whether you need undercover clothes or just like to carry a gun for self-defense, this is an excellent option for you. Only available in Right Hand. 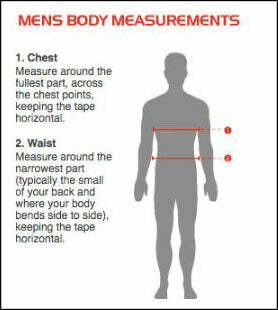 For shirts, the most important measurement in determining your correct size is your bust/chest measurement. The shirt should fit snugly around the bust/chest so that your weapon stays firmly in place and doesn’t bounce around when you move. If you order the shirt to fit your bust/chest, the rest of the shirt will stretch to accommodate a wider mid-section, and lightly hug a smaller midsection. Everything is fantastic about this product. I am so pleased with every aspect and glad I chose to spend my money on your company. The Under Tech V-Neck is like having a second skin. I've used it with the small Beretta .25, the medium sized Sig .380 P238 & the larger Ruger SR .40. The Under Tech keeps all 3 sizes snug to the body & very consealed. Finally, the UnderTech V-Neck keeps me cool & supported. Great fit quality made can not even tell you are carrying. Love the fasteners clip its not velco Don’t like the Velcro one that I have the clips are better way to go guys great product. Great fit, works well with my Ruger LCP. Need practice unhooking the retention strap but overall an excellent purchase. I ordered the Executive V-neck, great fit. I strongly recommend thid producy. I have been looking for a long time for something that would allow me to carry wearing casual but dressy attire and that would comfortably accommodate either my S&W 38 or my Bursa Thunder 380. My 642-2 J frame S&W is a bit fatter but nonetheless I can carry comfortably wearing either the Coolmax Tank of the V-Neck Tee. Both guns ride in a comfortable position no matter which shirt I wear. After I wash a few times and see how they hold up, I plan on ordering more of each, I'm in the woods and heavy brush a lot and carry 38 snake loads in my S&W and being inside under my arm there is less chance for a weapon snag on a limb. My grips on the S&W are fatter as I have the laser grips but still not to bulky nor is it impressionable. These are both great daily wear items and I like the flexibility they give me for work or dress up. Quality throughout ! XL fits perfect , quality construction very comfortable ! Excellent product. I want to try the standard model opposed to the Exec. And the one that must be for summer, ..... cool something. I got it, I tried it on, I put a gun in it, I liked it, I put another gun in it, I liked that too, I put a typical shirt I wear over it, I liked the fit and look, I ordered another. Man cannot live with only one concealed carry undershirt! Very Comfortable and conceals very well. I carry a p938 from sig and it is virtually invisible under a shirt. It will also hold a larger 9 mm and conceals well but obviously can be spotted but only if you were looking for it. I like it so much I'm going to get a white one this time. Very comfortable and works well with certain clothing worn while carrying my firearm. Overall, the fit, feel and wicking is incredible. The holstering makes my carry, out of sight, but not out of mind. It's by far, the best carry option that's on the market today! These shirts are fantastic. I wish they also could be made in lighter material so they could be worn more easily in summer.